Do you reside in Little Neck, Queens NY? Do you have kids? Are you searching for child day care in Little Neck, Queens NY? Have you been searching the internet for a child day care center in Little Neck, Queens NY? Instead of sending your child to a day care center, have you thought about sending your child to a Queens, NY summer day camp program? Prior to making the decision to send your child to a summer day camp program there are several things to consider. If you are interested in a child day care center program in Little Neck, Queens or a summer day camp program in Little Neck, Queens – then this article is for you. World of Discovery Summer Day Camp program of Bayside, Queens NY has been specializing in providing quality summer day camp activities for children from ages 4-15 years old for nearly 30 years. World of Discovery Summer Day Camp program features much more than the average child day care center can provide. Day care centers tend to be a viable option for children ages 3 and under. However if you think that your child is ready to experience an unforgettable summer filled with swimming, sports, field trips and much more – then World of Discovery Day Camp of Bayside, Queens NY may be just the right place for your child. Many Little Neck, Queens parents – as well as parents all over Queens – send their 4 year old children to day care centers during the school year from September to June. However, during the summer months of July and August, many of those parents send their 4 year old boys and girls to summer camp. Why? Just like their older counterparts, 3 and 4 year olds also need to get a break from their routines. At World of Discovery’s summer day camp program, children can take advantage of our fun and comprehensive swimming programs. Campers are provided with swimming lessons 5 times per week at no additional cost. Our aquatics director along with our team of American Red Cross certified lifeguards individually test each child and instruct campers accordingly based on their strengths and weaknesses. Campers are encouraged to become comfortable in the water in a fun and non-threatening environment. By the time the summer is over, some campers actually learn how to swim. Our private swimming pool is the perfect place for young campers to get used to the water on their paths towards learning how to swim. At a depth of just two feet, our inviting swimming pool is the ideal setting for teaching children how to swim. At World of Discovery, campers go on 2-3 summer day camp field trips per week. Rather than spending all of their time at one location, such as the case in a day care center, campers visit and get to experience some of the most exciting child-friendly places throughout Queens and Long Island. Children ages 4-14 years old are exposed to sports such as tennis, volleyball, dodgeball, baseball, wiffleball, softball, basketball, soccer, tennis and much more! Our summer day camp program offers children an amazing arts and crafts program where they can have fun and express their creativity. Children also let their imaginations soar while learning about science at our fun, educational and wacky science program run by NYS licensed teachers. If you are in need of full-time child day care, part-time day care, split week child day care, child care for 3 days per week, child care for 4 days per week or child day care services for the full 5 days per week, then we are confident that World of Discovery Day Camp of Bayside, Queens NY has a child day care program to fit your needs. You can choose from 2 week child day care programs, 3 week child day care programs, 4 week child day care programs, 5 week child day care programs, 6 week child day care programs, 7 week child day care programs and 8 week child day care programs. Our goal is to be as flexible as possible to accommodate parents’ schedules. You can select child day care weeks that are consecutive or choose weeks that are staggered. At World of Discovery Day Camp of Bayside, Queens NY we make it easy for you to pick and choose a summer camp program schedule that is certain to fit your needs and schedule. One of the best and most convenient features of our summer day camp program is that we offer door-to-door bus service (pick up and drop off) included in your summer day camp tuition. This convenience allows parents to stay home and take advantage of having their children picked up and dropped off right at their doorstep. Daily lunch is also included in the summer day camp tuition. 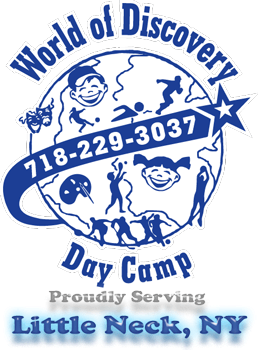 World of Discovery Day Camp’s summer day care program is located in beautiful Bayside, Queens NY. World of Discovery Day Camp of Bayside, Queens NY has been proudly offering the children of Bayside and the rest of the communities in Queens NY fantastic summer fun for nearly 30 years! This entry was posted in Activities for Kids in Queens, Best Camp in Little Neck, Child Day Care Program Little Neck, Choosing the Right Day Camp, Swimming Pools Queens, Swimming Programs Queens, World of Discovery Day Camp of Bayside and tagged child day care center Little Neck, Child Day Care Center Little Neck Queens | Tagged child care Little Neck Queens, kids gymnastics, Little Neck child day care center, Little Neck day care center, Little Neck gymnastics, Little Neck Queens day care center, Little Neck queens summer child care, Little Neck Queens summer day camp program, Little Neck summer day camp, queens gymnastics, summer day camp Little Neck Queens, summer day care center Little Neck Queens. Bookmark the permalink.